Thanksgiving is a day to spend with your family and friends. Frying a turkey can be dangerous. Place fryer in the grass, not on the driveway. Oil on concrete or black top can become slippery when wet. Wrap gas line in aluminum foil to protect it form any grease splatter. DO NOT fry a frozen turkey! Have an extinguisher near by, just in case. Do not leave fryer unattended and keep children away from frying area. Follow the link below for more information on frying a turkey. Be safe! It is fun to decorate for the winter holidays, but holiday decorations can increase your risk of a home fire. As you deck the halls this season, be fire smart. When you’re decorating with live trees, make sure you keep the tree watered. If a dry tree comes in contact with a flame, it can catch on fire in fewer than 10 seconds and spread quickly throughout your home. Take a minute to watch this video which shows the difference between a dry and watered tree. Choose the freshest tree you can find. Check to see if the needles stay when you gently pull on a branch. After making a fresh cut on the trunk and placing the tree in a stand, fill the stand’s water basin. 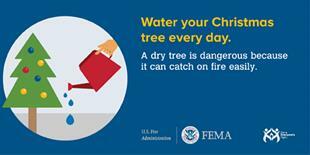 Make sure you water your tree every day. 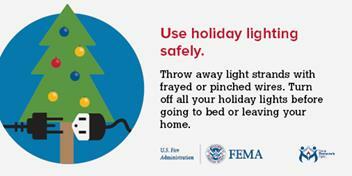 Keep electrical cords and lights away from the water. Choose holiday decorations that are flame resistant or flame retardant. Choose holiday lights with a label from an approved testing laboratory, such as UL, and throw away any frayed or damaged light strands. Place your tree at least three feet from heat registers, space heaters, and fireplaces. If you decorate with candles, make sure they are at least three feet away from anything that can burn. Consider using battery-operated flameless candles, which can look, smell and feel like real candles. “Keep the Wreath RED” is a program designed to focus an awareness of safety while decorating your homes for the holidays. Our fire department places a wreath on the front of the station and lights it with a string of red lights. The wreath remains lit 24 hours a day throughout the holiday season. Whenever a fire occurs that is a result of holiday decorations, a white bulb replaces a red bulb on the wreath. This serves as a constant reminder to practice safety while installing and displaying holiday decorations. All decorations should be nonflammable or flame-retardant and placed away from heat vents. Ensure that trees and other holiday decorations do not block an exit way. In the event of a fire, a blocked entry/exit way puts you and your family at risk. Make sure all smoke and carbon monoxide alarms are in working order. Candles may be pretty to look at but they are a cause of home fires and home fire deaths. Remember, a candle is an open flame, which means that it can easily ignite anything that can burn. Think about using flameless candles in your home. They look and smell like real candles. Use candle holders that are sturdy and won’t tip over easily. Light candles carefully. Keep your hair and any loose clothing away form the flame. Don’t burn a candle all the way down – put it out before it gets too close to the holder or container. Never leave a child alone in a room with a burning candle. Keep matches and lighters up high and out of children’s reach, in a locked cabinet.